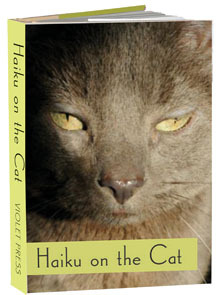 In this collection of haiku, twenty-two poets reflect on the cat. Kate Bell introduces the collection by observing that "whether they are up to benign mischief, stretching on a back porch, or stalking in a backyard our cats are poetry in motion, or in stillness. No wonder studies show how our possessing cats (or is it the other way around?) relieves our stress. Indeed they offer us joy, humor, and peace. The works of the writers and the artists included in this little book express that the cats' zest for life is zen for us. Felines inspire flights of fanciful imagination and devotion in the hearts and minds of poets and pet owners alike." Many of the illustrations were provided with assistance from Fancy Cats Rescue Team. Since its founding in 1997, Fancy Cats has found homes for thousands of cats facing euthanasia in animal shelters in the Washington, D.C. area. To learn more about their work visit http://www.fancycats.org. Haiku on the Cat features work by Carolyn Archibald, Sharon Hammer Baker, Allan Burns, Kenneth Elba Carrier, Robert Ertman, Carolyn M. Hinderliter, Carol L. Jordan, John Kinory, Susan Marie La Vallee, Kent Allen Lolling, Peggy Willis Lyles, C. R. Manley, Jeannie Martin, Michael McClintock, Michael Moore, Audrey Olberg, Ellen Pratt, Edward J. Rielly, Tony A. Thompson, Elizabeth Warren, Julie Warther, and Carmel Lively Westerman.